As funny and heartfelt as Seth Rogen was on Freaks And Geeks and Undeclared, even fans of those shows might be surprised by the degree to which he’s become a comedy factory unto himself. Though he spent time as part of the Judd Apatow repertory company, Rogen has branched out into his own writing and directing, often with his buddy Evan Goldberg, to the point where he can feel like the primary auteur on his films even when he’s not technically the credited filmmaker, or even the most central character. For example, Rogen did not write or direct The Night Before, his new Christmas comedy. Director Jonathan Levine, brought into the Rogen fold via 50/50, receives a story credit and a co-writing credit alongside a stable of Rogen-affiliated scribes (including Goldberg but not Rogen himself). 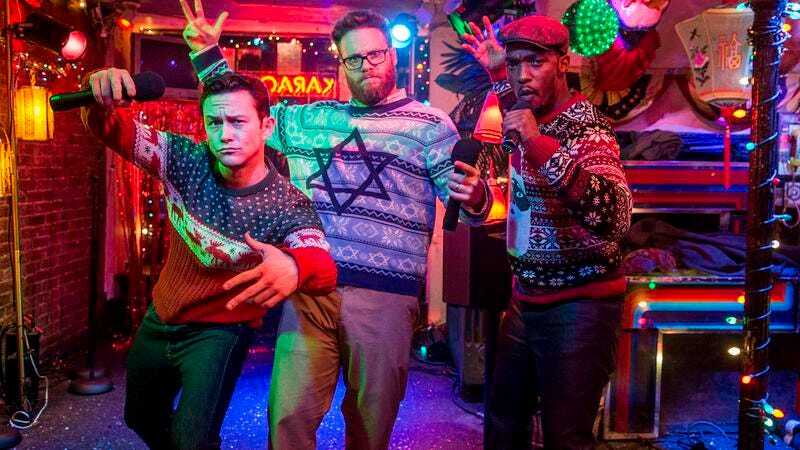 The Night Before is also a 50/50 reunion of Levine, Rogen, and Joseph Gordon-Levitt. And as with most Rogen movies, it’s about friendship and growing up; as the star gets older, he’s been finding new ways to come of age every four or five years. Here, Rogen’s Isaac is, arguably, the most mature bro in a trio of longtime best friends; he’s married to Betsy (Jillian Bell) and they’re expecting their first baby. Chris (Anthony Mackie) is a newly successful late-career football player, which leaves Ethan (Gordon-Levitt) as the arrested adolescent. Ethan doesn’t hold a real job—he’s first seen dressed as an elf for a Christmas catering gig—and seems to live for his friends’ annual Christmas Eve get-together, a friends-as-family tradition forged in the wake of his parents’ death years ago. But adulthood continues to encroach, and the movie finds the guys embarking on their final big night out, with the goal of attending a long-rumored but never-glimpsed secret holiday blowout. In a lot of ways, then, this is a more grown-up Superbad; the buddies are more confident, the responsibilities are more concrete, the party is more elaborate, and (perhaps incongruously) the drugs are more dangerous. This puts Levine, who started off in the indie world with movies like the long-shelved horror picture All The Boys Love Mandy Lane and the stoner coming-of-age dramedy The Wackness, in the position to differentiate the film from perhaps the best Rogen/Goldberg-written movie, along with plenty of others since then. Style-wise, he does—for better and for worse. He uses bleary, blown-out white-light accents to give the movie’s New York setting touches of dreamy grit, perfect for capturing the lived-in feeling of taking a break for some N64 GoldenEye at a friend’s mom’s house. But he also indulges an unfounded antsiness, especially in the first half, by cutting around conversations restlessly, sometimes across the 180-degree line that’s supposed to keep character positioning clear. The movie settles down, but some of the early scenes made the unobtrusive Apatow style look even better by comparison. The Night Before isn’t Rogen’s funniest movie. Minute for minute, it doesn’t have as many laughs as Superbad, Neighbors, or This Is The End, among others. But it does contain one of Rogen’s funniest performances, as Isaac navigates a very long and very bad drug trip, a responsibility-free Christmas gift from his wife. At one point, he records an addled rant into his cell phone that’s both hilarious and, in its way, raw with nervous emotion. That emotional component is supposed to belong more to Gordon-Levitt, and he’s affecting as a drifting thirtysomething. But as in 50/50, the actor sometimes segregates the pathos a little too firmly from his sense of humor. If Gordon-Levitt is still left wanting for a perfect comic vehicle, The Night Before also employs a deep bench of female comic talent that includes Bell, Mindy Kaling, Ilana Glazer, and a slightly underused Lizzy Caplan. None of them get a part as meaty as Rose Byrne’s in Neighbors, but they all get laughs—and perhaps more importantly, none of them play a killjoy nag. In fact, The Night Before doesn’t have any villains, even of the caricatured bro-comedy variety. Betsy is a funny, supportive wife even when she’s annoyed with Isaac; Chris’ semi-feared mother is a little overbearing, but warm. Even a couple of drunkards dressed as Santa Claus resist easy stereotyping: When Ethan dismisses them as frat boys, they angrily supply their actual, grown-up professions. Levine, Rogen, and company manage to convey holiday sweetness and sadness without resorting to quasi-cynical posturing about what a pain the season is. Not many of the movie’s jokes linger after the credits roll, but its inclusive warmth does.